'No More Deaths' Volunteers Face Possible Jail Time For Aiding Migrants As security has tightened along the U.S.-Mexico border, migrants are forced into more hostile desert areas. Volunteers who put out water and food say they're trying to prevent deaths. 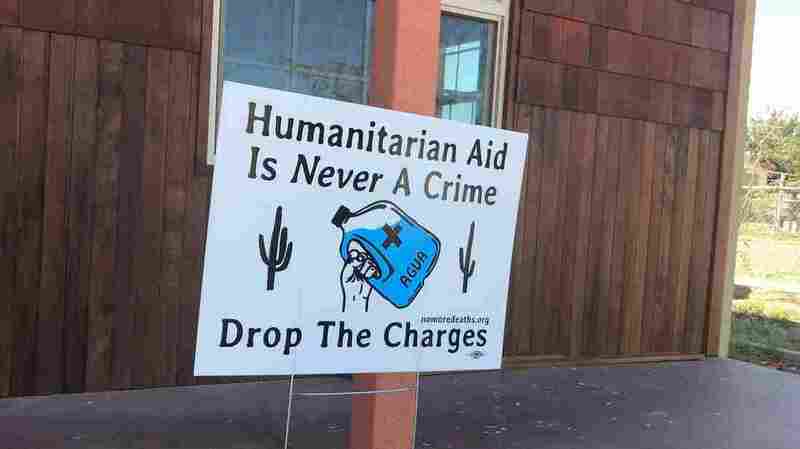 A yard sign in Ajo, Ariz., expressing support for migrant aid workers. Four of the group's volunteers were convicted of misdemeanors after leaving water and other supplies in the Cabeza Prieta National Wildlife Refuge near Ajo, Ariz. They face up to six months in jail. At their trial last month, prosecutors accused the volunteers of giving "false hope" to migrants. Over the past several decades, migrants have turned to more rugged parts of the border to cross, driven there by a larger border patrol, and more miles of border fencing. Hundreds of migrants die every year — mostly from dehydration in the scorching heat, or from hypothermia as temperatures plunge at night. Migrant aid activists say they're trying to prevent these deaths by leaving water and other supplies in the desert. 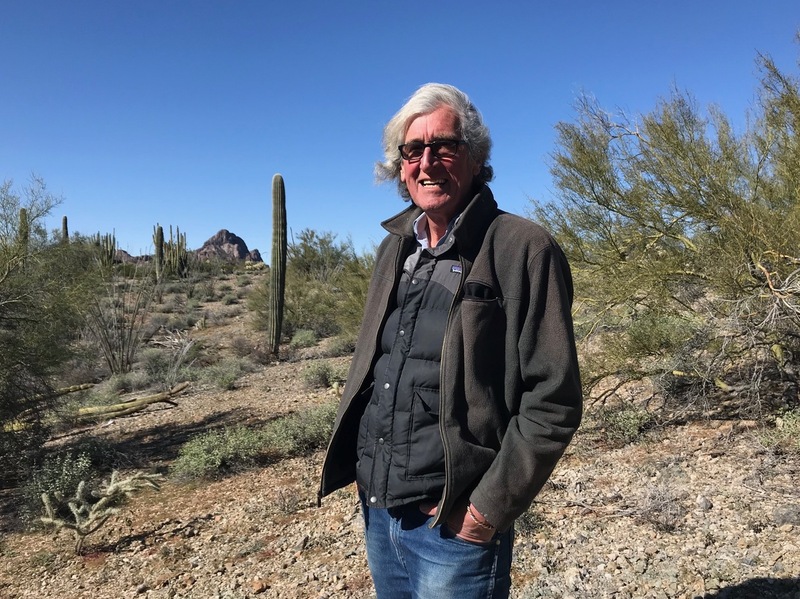 John Orlwoski, a migrant aid volunteer, in the desert outside Ajo, Ariz.
"I don't believe I do anything illegally," said volunteer John Orlowski. He lives in Ajo, a small town about 40 miles from the Mexican border, surrounded on all sides by the Sonoran desert. It's a landscape that is both beautiful, Orlowski says, and hostile. He recently moved to Arizona from California, where he used to help search for lost hikers in Yosemite National Park. Now Orlowski helps migrants making the trek north from Mexico. He says it's dangerous even for an experienced climber and backpacker like him. "I would not be able to do this journey," Orlowski said. "It is impossible in the summertime to carry enough water." But now law enforcement is cracking down on these volunteers. "I think they mean well," said Art Del Cueto, vice president of the National Border Patrol Council, the union that represents Border Patrol agents. But Del Cueto thinks these volunteers are misguided, because some of the supplies they leave wind up in the hands of drug smugglers and human traffickers. And Del Cueto says migrants in trouble can activate one of dozens of rescue beacons in southern Arizona to call for help. "We respond to a lot of calls of illegal aliens in stressful situations, tough medical situations," Del Cueto said. "And we're the ones that are properly equipped to go out there and save them. We're not out there mistreating anyone." Still, migrant aid volunteers question the Border Patrol's commitment to saving lives. They point to multiple incidents in which agents have dumped out jugs of water that were left in the desert. Last year, No More Deaths released this video of a Border Patrol agent standing over a row of plastic water jugs that were intended for migrants. "Picking up this trash somebody left on the trail," the agent says, while pouring water out of the jug. Volunteers who've been caught leaving water and food for migrants have gotten into big trouble. Four No More Deaths volunteers were convicted after leaving supplies in the Cabeza Prieta refuge. Magistrate Judge Bernardo Velasco found them guilty of abandonment of property and of entering the refuge without a permit. They face sentencing on Friday. Four other No More Deaths volunteers were also charged with misdemeanors for their volunteer work at the Cabeza Prieta refuge in 2017. But last week, the group announced that prosecutors had agreed to drop criminal charges, and that the activists now face civil infractions carrying a fine of $250 each. 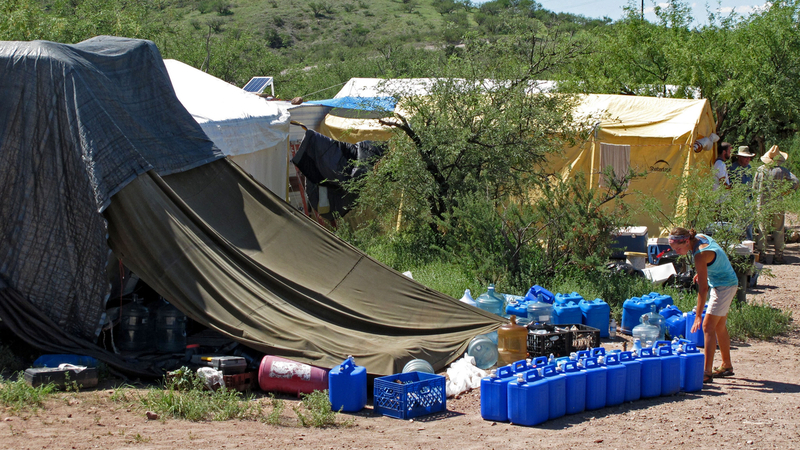 A No More Deaths volunteer, Katie Maloney, checks water jugs at the group's camp before heading out to supply water stations for undocumented migrants near Arivaca, Ariz., in 2010. Four other volunteers were convicted of misdemeanors after leaving water and food for migrants in the Arizona desert. Another No More Deaths volunteer, Scott Warren, is set to go to trial in May on felony charges. The government says he was harboring undocumented immigrants. Warren argues he was helping migrants in distress. If convicted, he faces up to 20 years in prison. "The government has decided to respond by essentially criminalizing the act of giving someone who's dying of thirst a gallon of water," said No More Deaths spokeswoman Catherine Gaffney. Gaffney argues these volunteers haven't committed any crimes. And her group is undaunted. "We still go out every day and place water on trails," she said. "And we are going to continue our work to prevent more deaths."